Offering you a complete choice of products which include rajputs & moghols holiday packages, mehrangarh fort holiday packages, mehrangarh holiday packages, durbar square holiday packages, amber fort jaipur holiday package and mandor ki chatri jodhpur holiday package. Breakfast at the hotel and theafter leave by road for the region of Shekawati. Lunch enroute. Arrive in the evening. Dinner and overnight at the hotel. Early breakfast at the hotel and thereafter sightseeing of the Region of Shekawati. Visit the numerous ancient and beautiful Havelis of Nawalgarh, Mandawa and Fatehpur. The walls of the havelis are covered with beautiful frescoes. Lunch during the course of the sightseeing, and then leave for Jaipur and arrive in the evening. Breakfast at the hotel and thereafter excursion to the formidable Fort and Palace of Amber. Elephant ride ( subject to availability of elephants ) or jeep ride upto the Fort. Lunch in a local restaurant and thereafter City and Palace of Jaipur. Early breakfast at the hotel, then leave for Agra. Entoute stop for lunch at Bharatpur and visit the bird sanctuary by rickshaw. Continue for the sightseeing of Fatehpur Sikri. Arrive Agra in the evening. Dinner and overnight at the hotel. Early breakfast at the hotel and thereafter visit the Taj Mahal and the Red Fort. Afternoon, visit the tomb of Itimad ud Daulah and Dayal Bagh and then time free. Attention - The Taj Mahal is shut on Fridays. Leave for Delhi and arrive in time for lunch at a local restaurant. Afternoon, sightseeing of New Delhi. Dinner in a local restaurant and then transfer to the international airport. A room will be made available at a hotel for a quick wash and change before leaving for the airport. Breakfast at the hotel and theafter leave by road for the region of Shekhawati. Lunch enroute. Arrive in the evening. Breakfast at the hotel and thereafter leave for a full day sightseeing of the Region of Shekhawati. Visit the numerous ancient and beautiful Havelis of Nawalgarh, Mandawa and Fatehpur. The walls of the havelis are covered with beautiful frescoes. Lunch during the course of the sightseeing. Return to the hotel in the evening. Breakfast at the hotel and thereafter leave for Bikaner, a fortified city of red granite sorrounded by high medieval ramparts. 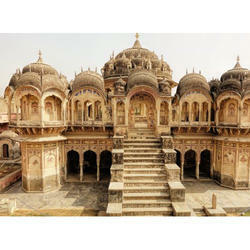 Arrive in time for lunch at the hotel and thereafter visit the old city and the Immense Fort of Bikaner. Breakfast at the hotel and thereafter leave for Jaisalmer, a fortified city on the caravan route from Karachi ( Pakistan ) to Delhi. Stop for lunch at the small but impressive fort of Pokharan. Arrive Jaisalmer in the evening. Dinner and overnight at the hotel. Breakfast at the hotel, and thereafter visit the old city and the Fort of Jaisalmer. 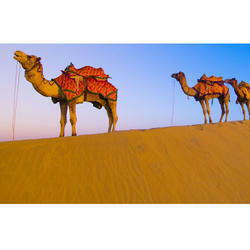 In the late afternoon leave for the village of Khuri to witness a glorious sunset over the sand dunes. Early breakfast at the hotel and thereafter leave for Jodhpur. Enroute, stop to visit the royal cenotaphs at Mandore. Arrive at Jodhpur in time for lunch. 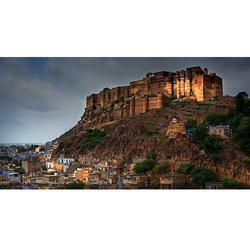 Afternoon visite the city and the Mehrangarh Fort of Jodhpur. Very early morning, transfer to the railway station and leave for Jaipur. Upon arrival transfer and check in at the hotel. Then, lunch at a local restaurant and proceed to visit the city and Palace of Jaipur. Lunch in a local restaurant and thereafter visit the Fort of Jaigarh which overlooks the Amber fort. Early breakfast at the hotel and thereafter leave for Agra. Enroute, stop to visit the deserted city of FATEHPUR SIKRI. Arrive Agra in time for lunch at a local restaurant, and thereafter proceed for the sightseeing of the Taj Mahal and the Red Fort. Early breakfast at the hotel and thereafter leave for Delhi. Upon arrival, lunch in a local restaurant, and thereafter proceed for a quick sightseeing of Old Delhi and New Delhi. Dinner in a local restaurant and thereafter transfer to the international airport. Early Breakfast at the hotel. Visit the numerous ancient and beautiful Havelis of Nawalgarh, Mandawa and Fatehpur. 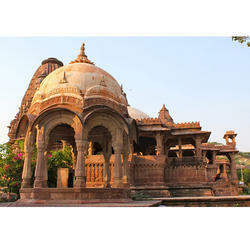 Then leave for Bikaner, a fortified city of red granite surrounded by high medieval ramparts. Breakfast at the hotel and thereafter visit the numerous ancient and beautiful Havelis of Nawalgarh and Mandawa. Lunch at Mandawa and leave for Bikaner, a fortified city of red granite sorrounded by high medieval ramparts. Enroute, stop to visit the Havelis of Fatehpur. Arrive Bikaner in the evening. Dinner and overnight at the hotel. 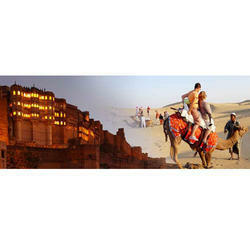 Breakfast at the hotel and thereafter and thereafter visit the old city and the Immense Fort of Bikaner. Early lunch at the hotel, and then leave for Jaisalmer, a fortified city on the caravan route from Karachi ( Pakistan ) to Delhi. Upon arrival, lunch in a local restaurant, and thereafter proceed for the sightseeing of New Delhi. At about 11kms from Jaipur, this fort controlled the plains in the 15th century, and is a beautiful example of Rajput architecture. One arrives on elephant back at the entrance to the courtyard of the fortress. Then a visit to the Kali temple to attend a brief morning ceremony. The visit of the public and private areas of the Fortress, along with the visit of the hall of mirrors and the apartments of the harem hold numerous delightful surprises. A few kilometers from Jodhpur, in a beautiful garden adorned with basins and fountains, a group of cenotaphs of different styles have been built in the memory of each of the princes and princesses of the Rathore lineage. Early morning, transfer to the domestic airport and leave by flight for Ahmedabad. Upon arrival, transfer to the hotel. Lunch at the hotel, and thereafter visit the old city of Ahmedabad. Dinner and overnight at the hotel. Early breakfast at the hotel, then leave for a full day excursion to visit the ancient stepwell of PATAN, the quaint british style houses of SIDDHPUR, and the Sun Temple of MODHERA. Lunch in a local restaurant. Return to Ahmedabad in the evening. Dinner and overnight at the hotel. Breakfast at the hotel. Morning, excursion to visit the stepwell of ADALAJ. Lunch in a local restaurant, and thereafter visit the CALICO TEXTILE MUSEUM. Dinner and overnight at the hotel. Breakfast at the hotel and then leave by road for Vadodara. Arrive in time for lunch. Afternoon, sightseeing of the city of Vadodara. Dinner and overnight at the hotel. Breakfast at the hotel. Morning leave for the archaeological site of Lothal and visit the remains of the Indus civilization ( Caution - The museum is closed on Friday ). Early breakfast at the hotel, and thereafter leave for a full day excursion to visit the temples of Palitana on the sacred hills of Shatrunjaya. Early breakfast at the hotel, then leave for the small town of Diu. Arrive in time for lunch.Afternoon, visit the Fortress and the Cathedral of Diu.Dinner and overnight at the hotel. 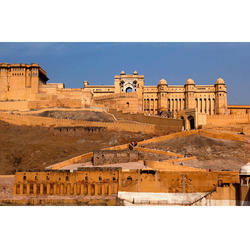 We are offering a wide array of Amer Fort Holiday Packages. Our team helps our clients to choose packages as per their demand and budget. Our professionals have experience that helped them in offering this holiday packages service in the best possible way. The capital of Rajasthan is an immense decor of operetta, of pink and white structures where come thousands of peasants in their multicolored costumes to exchange their goods. "Hawa Mahal" the palace of wind, a curious facade of screens of stone network, the Observatory, and finally the City Palace which now houses a collection of miniatures, carpets, arms and costumes of Rajasthan. About 40 kilometers away from Jaipur, a visit of this village allows you to learn about the ancestral techniques of manual printing of cotton fabrics used in Rajasthan. One also witnesses here the handicraft production of papermaking and blue potteries. A delicate 17th century Jain temple in white marble is also situated here. The white capital of Mewar was founded by Maharaja Udai Singh in the 16th century, in the mountains and on the banks of the Lake Pichola. The most striking visit of Udaipur is the City Palace. 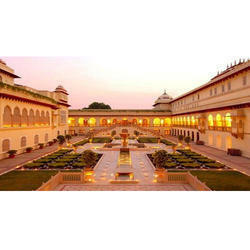 It is the largest and the most sumptuous palace of all Rajasthan. It was built in the 16th century on a hill overlooking the Lake Pichola and the town. The palace is a huge maze of halls, rooms, terraces and courtyards connected by an intricate network of corridors and stairs. The attraction of this palace is the wall decoration of the rooms and in the beautiful terraces. It houses a collection of miniatures and paintings. The bustling bazaars offer treasures of handicrafts and artifacts: silver, embroidered fabrics, paintings. 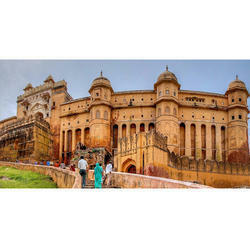 This enchanting region is situated on the way from Jaipur or Delhi to Bikaner. The towns of Shekhawati region are known for their amazing painted havelis. So varied and architecturally rich are the havelis that this region is dubbed as the "open art gallery of Rajasthan". The plethora of painted Havelis in rich artistic tradition makes them fascinating. Most of the buildings are dated from 18th century to early 20th century. Various forms of fine art adorn the walls and the ceilings of these structures as a contrast to the otherwise flat and barren land. The havelis are noted for their frescoes depicting mythological themes and huge animals. Some later day frescoes reflect British influence in the form of steam locomotives and trains depicted on them. The 'must see' townw are Mandawa, Nawalgarh, Alsisar and Fatehpur. 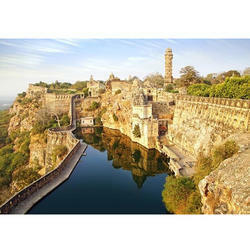 The Chittorgarh (or Chittor) fort was founded in the 8th century by Bappa Rawal. The fort is famous for the three sieges which its inhabitants had to face and the particularly bloody way they ended. The inhabitants of Chittorgarh, facing defeat, declared the Jauhar. Men fought to the death in saffron robes while the women immolated themselves along with their children. This citadel is built on a hill 170m high. The entrance to the fort is through the seven gates which were designed for defensive purposes. Isolated in the heart of the Mewars hills, the spectacular complex of the Jain temples of Ranakpur is a true wonder. The temple of Adinath with its 1500 columns of white marble at different levels, and a bewitching atmosphere in the main sanctuary, is always active. 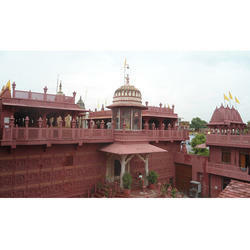 One can also visit the three smaller temples constructed nearby in the same era. 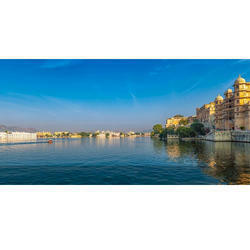 Located at the gateway to the desert, Pushkar is a holy Hindu city. About 400 temples and shrines stand around the sacred lake. According to religious texts, Brahma had performed a ritual sacrifice (yajna) on its shores. Pushkar is now known worldwide for its camel fair in October or November.The lake is surrounded by steps called 'ghats' so that Hindus can immerse themselves in the lake for a purifying bath.According to legend, Vishnu would have appeared on the Varah Ghat in the form of a boar and Brahma had made a sacrifice on the Brahma Ghat. The ashes of Mahatma Gandhi were immersed in the waters at the Gau Ghat, now known as the Gandhi Ghat.In the evening, the faithful float illuminated oil lamps on the water. This gives a spectacular view of the lake at dusk. The 'Blue City' dominated by an 'Eagle's nest' Fort, Jodhpur played an important role in the 17th century during the period of the Rajput-Moghul rivalry. This imposing military fort, with its unique architecture, houses an impressive collection of arms, palanquins and miniatures. One must visit the covered space of canons and the blue city of Brahmins.The Jaswant Thada Cenotaph near the fort is an architectural landmark. It is a white marble memorial built in 1899 in memory of MaharajaÂ Jaswant Singh. 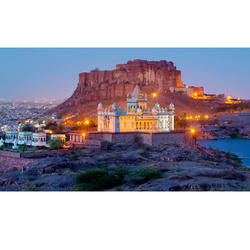 The Jaswant Thada is also a traditional cremation ground of the Jodhpur princes. Dubbed the Golden Pearl in the Thar desert,Jaisalmer was founded in the 12th century and became an important waypoint on the caravan route for 7 centuries.Princes, priests, and merchants made a beautifully carved city of yellow sandstone.The Fort, founded by the Maharawal Jaisal Singh, is surrounded by a wall of 9 km with round towers, and dominates the desert. It houses the Royal Palace, the Palace for the women of the court, 5 Jain temples of great beauty, and a part of the city where the quiet country life follows its course. The fort entrance doors and the royal balconies are especially beautiful.Gadisar, the sacred lake, is protected by a beautiful carved door dating to the 17th century. The royal cenotaphs of Barra Bagh (or the princely garden) hill tells the story of the dynasty. The view of from the cenotaphs at sunset is beautiful.Time goes by quickly while wandering through the darke narrow lanes between the 'Havelis' of the ancient city situated just outside the rampartsof the fort. The fabulous mansions of the marwari merchants were built in the 16th century and are exquisitely carved with sandstone facades. The colorful handicrafts also add charm to the visit. 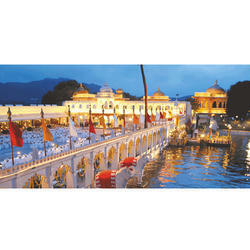 We are offering a wide array of Jag Mandir Hotel Udaipur Tour Service. These services are rendered under the direction of domain experienced person as per the client’s needs. We assure the needs of clients to provide an effective solution. In addition to this, these tour services are offered using quality tested resources within the limited period of time. 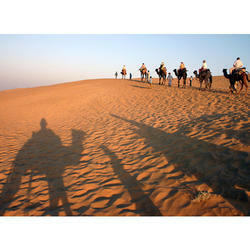 Leveraging our high industry proficiency, we are able to provide Desert Safari Tours. Executed by a team of experienced employees, these tour services are admired in the market. In addition to this, the clients will be pleased to know that we have a complete process of the tour done step by step.